Like many of life’s great endeavors — such as getting in shape or starting your career — saving for retirement is better for those who start earlier. This is a general truism, but especially relevant today with a more challenging economic landscape that’s seen wages stagnate and the costs of education and housing skyrocket. While saving for retirement is not more important for one age group over another, it can be especially challenging for those at the younger end of the workforce who just don’t have the capital, and those at the older end who didn’t get ahead when they had the chance. Look at the graph below. By starting to prepare for retirement early, even if it’s just a little amount, you can significantly increase your capital later in life when you actually need it. If you’re young, then congratulations! You have a tremendous opportunity to set yourself up for a healthy financial future. How do you do that? First, start by saving. There are no hard and fast rules for how much you should be saving, but a generally accepted starting point is 10% of your paycheck. To get a slightly more accurate idea, use a retirement savings calculator like those at Kiplinger or Smartasset.com. While not accurate to a tee, these will give you a rudimentary figure for how much you should be saving now. The second thing you want to do is invest those savings. There are two main types of accounts used for this exact thing: 401(k)s and Roth accounts. 401(k)s are fantastic tools for building your retirement cushion because many employers offer 401(k) match programs. This just means that whatever you contribute to your account, up to $18,000 per year, the employer will also contribute that amount, essentially doubling your money. 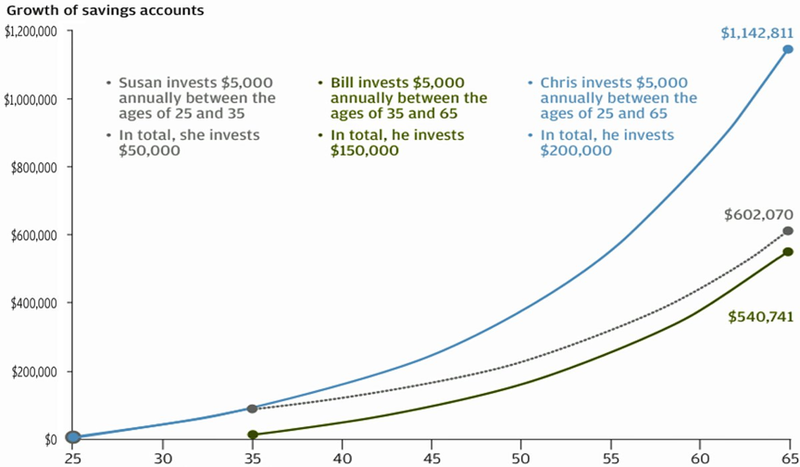 So if you’re putting $2,000 into your 401(k) every year, you’d get an extra $2,000. That’s free money for you! 401(k)s are also protected from bankruptcy, so you get to keep whatever you earn from these accounts until you’re allowed to withdraw from them at age 59. A roth account, such as a Roth IRA, is another great option for retirement. With Roth IRAs you can invest up to $5,500 per year and let that money earn gains for you over time. The best part about Roth IRAs is you don’t have to pay taxes on the money you’ve earned over time. So when the $5,500 you originally invested became $10,000 after you withdraw, you won’t have to pay any taxes on that new $4,500. If you didn’t get a jump start on retirement by doing these things when you were younger, it’s ok. There are still ways to catch up. First, open a Roth account or 401(k) ASAP (better late than never). Second, consider cashing out the equity from other parts of your life. Do you drive a nice car? Unless it’s a classic, it’s only going to get less valuable over time. Dump it now and go for something more moderate. Also you may want to consider selling your home if you’ve bought it. Homes are tremendous sources of equity, and flipping your current spot to a downsized one can net you a massive cash windfall. It may also be a good idea to build up your investment portfolio if you haven’t already. Invest in equities, such as stocks, ETFs and mutual funds, that historically have higher yield than other types of investments. But do this wisely! Returns from stock investments are never guaranteed and come with more risk. An index fund is one way to invest in equities while minimizing your risk. An unfortunate byproduct of not saving for retirement at a young age is you may have to work a little later. But that’s ok! Adding a few more years at the end of your career might not be ideal, but it can be the difference between being able and unable to afford a decent quality of life in retirement.